US President Donald Trump said on Twitter Friday that he continues to hold North Korea responsible for the 2017 death of Otto Warmbier, a US college student who died shortly after being returned to the US following a prison sentence in North Korea for theft. The news comes over a month after the young woman announced her plans to escape the country in a video released online, explaining her decision by the fact that in the UAE she couldn't live her life the way she wanted. The issue came into focus when four migrant laborers contracted by the Sridurka Hindu Temple in Canada for construction work were interviewed by the Canadian Broadcasting Corporation (CBC). Between 12 and 22 political prisoners incarcerated in Iran’s infamous Gohardasht Prison have been protesting inhumane treatment by engaging in a hunger strike, some of them for over a month - but prison officials have not budged or indicated that they are any closer to meeting the prisoners’ demands. OSCE Representative on Freedom of the Media called on Ukraine to refrain from mistreating foreign journalists after the incident with Russian journalist Anna Kurbatova. 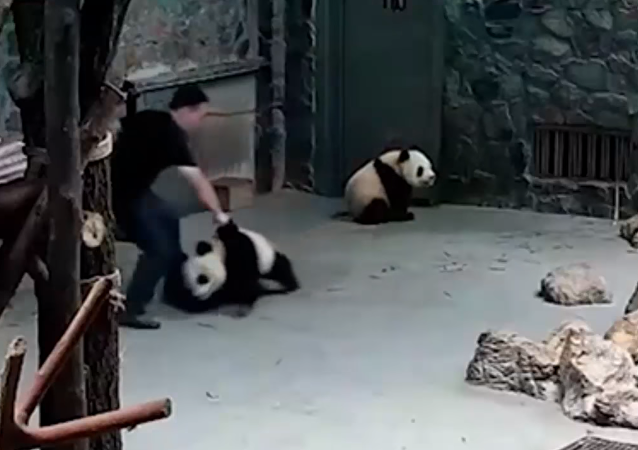 Unleashing their inner Po, the kung-fu fighting panda voiced by Jack Black, two giant pandas threw down after zookeepers went to extremes to keep the black-and-white beasts inside their pen. Amazon has once again been accused of wretched treatment of its workers, this time by a Scottish politician, who called conditions at a warehouse in the country "intolerable."